DeWalt has built a name in tool industry with professionals and DIYers actively looking for their products for their craft needs. DeWalt products deliver immense value and they perform just as they have been advertised and these are a few of the reasons why they are popular. One of their tools that has been gaining a lot of rave reviews lately is the DeWalt DWS780 that allows its users make angled cuts with ease when working with wood and other materials. It is also one of the powerful miter saws around with the 3800 rpm that its motor can generate allowing you to power through cuts with ease. It features a sliding arm that increases its cutting width and this is what makes it special and more reliable than non-sliding miter saws. These features make it ideal for the professional woodworker who deals with heavy stock. The occasional user who is passionate about the crafts can also use it with ease. There were a few users who complained that the unit was difficult to use and this can be attributed to the presence of a sliding arm. These are just some of the features of the DeWalt DWS780 and will look at them in detail to see if it’s the right fit for you. The DeWalt DWS780 has a powerful motor that makes it ideal for different cutting jobs even those that involve a lot of large stock. As a profession craftsman, your woodworking activities may involve stock of different sizes and with the DeWalt DWS780 you will not have to change saws when making cuts through different types and sizes of woods. The 3800 rpm that the motor can generate is just sufficient for everything that you have to do and this versatility makes the DeWalt DWS780 ideal for professional and DIY woodworkers. Cutting through wood will take a short time and this will definitely boost your work output. Accuracy and precision when cutting through surfaces will make your cuts appealing and the DeWalt DWS780 is the miter saw that you should get if you desire professional grade cuts. You can easily make changes to your cutting angle using the positive stops and this will deliver the precision that you desire when making cuts. The saw also features a cam-lock that secures your cutting angle when working on your materials and this also contributes to the saw’s accuracy. If your work entails a lot of movements at your workstation or you are a mobile craftsman who moves around with his or her tools, then portability is one of your top priorities when choosing a miter saw and lucky for you, the DeWalt DWS780 is one of the lightest saws around. 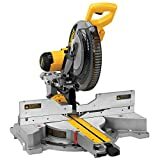 You will also need a portable miter saw when working on surfaces in your home and the DeWalt DWS780 will also help you with that. It weighs just 56 pounds which is light when it comes to miter saws. You can, therefore, shift your workstation with ease and this will definitely enhance your work output. Does the DeWalt DWS780 have an active warranty? Yes, it does. It comes with a 3-year warranty that covers the products against faulty parts and the manufacturer’s defects. You will also get the product serviced for free for the first year after purchase as well as a 90-day money back guarantee should you wish to return the miter saw. Is the DeWalt DWS780 safe to use? The DeWalt DWS780 is one of the safest miter saws on the market. The blade is secured with a guard cover that keeps the blade away from you at all times. The blade is in a bright yellow color and this makes it quite visible and easy to avoid. Can I use the DeWalt DWS780 with a 100V/50Hz power supply? The recommended power supply to use with the DeWalt DWS780 should be rated 120V/60Hz. You will interfere with the functionality of the saw if you use any other power supply. To determine how users received the DeWalt DWS780, we searched online for reviews of the product and participated in discussion forums so as to get the views of those who have used the product. Most of the reviews were positive with many people of the opinion that the ability to generate a lot of power for their cutting needs was a great feature that simplified their cutting. As we have highlighted earlier in the post, the compact build of the DeWalt DWS780 was another feature that the users liked of the product with most buyers saying that it made transporting and storing the saw very easy. The sliding component introduced some complexities in operation and this was highlighted by some users who said the miter saw was difficult to use. From the user reviews, it is evident that the DeWalt DWS780 is well received and as such, we highly recommend it to professional and DIY users alike. The DeWalt DWS780 checks all the boxes that make a good miter saw. It incorporates a sliding component that increases your cutting capacity and its raw power will make it easy to handle complex cutting assignments. It is light as well and this will make it easy for you to move around with it. We, therefore, highly recommend it to anyone who needs to get some cutting done.